The Isle of Mull offers peace, quiet, solitude to those who want it and a wealth of activities to suit all ages and interests. 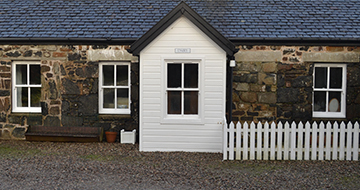 The self-catering accommodation at Ardnacross is ideally situated to make the most of the wide variety of activities this beautiful island has to offer. The main town of Tobermory, with its iconic harbour of multi-coloured houses is tucked away just 5 miles from Ardnacross. Here you will find plenty to entertain you and your family. There are some outstanding places to eat, including the Les Routiers recommended fish and chip van on the main pier. A firm favourite of ours is Cafe Fish situated in the old Harbour Masters office with great panoramic view of the bustling harbour. Some of the best Tobermory views are from the Conservatory Restaurant at the Western Isles Hotel overlooking the town. Back on the waterfront enjoy delicious home-made ice creams from the (refurbished!) public loos! Stroll around the shops for locally produced food, crafts, silver and soap. Learn about the history of Mull at the Museum and about the sea at the Mull Aquarium at the Harbour Association building (Taigh Solais) in the harbour complex which also includes the distillery and MacGochans Bar and Restaurant. Join the locals in the Mishnish at the end of an enjoyable day or visit the renowned Mull Theatre at Druimfin on the way home. Tobermory has a well- stocked Cooperative supermarket, The Island Bakery bakes daily bread, rolls, cakes as well as freshly made sandwiches and hot snacks; it has a small cafe and a delicatessen counter where you will find locally produced cheeses. These come from the Sgriob-ruadh Isle of Mull Cheese Company just outside Tobermory and which is well worth a visit to see the cheese being produced. 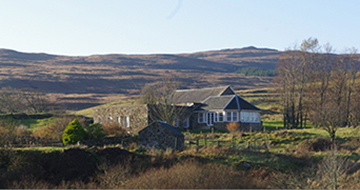 Cuts of our own Ardnacross beef, lamb, venison and eggs are available to buy from our farm shop.In the opposite direction from Ardnacross and Tobermory, the charming village of Salen boasts a wonderful Italian restaurant, a useful Spar shop and garage. Walkers will not be disappointed by the wonderful walks available at Ardnacross. 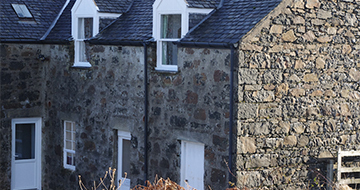 From your front door you will have the choice of excellent hill walking or if you prefer something a bit less challenging there are lovely farm walks down to the cove or the mouth of the burn. Away from Ardnacross, there is the challenge of Ben More best undertaken on a clear day and well worth the climb as the views from the top are spectacular. MacKinnon’s Cave and Fingal’s Cave are well worth the trip; both can be organised by local tour guides details of which will be found in all of our self-catering accommodation. There are two lochs at Ardnacross which can be used by arrangement for trout fishing. Salmon and sea fishing can also be arranged locally, either short trips for mackerel or longer day trips out to catch larger fish. The largest Skate ever caught was in the sound of Mull. or neighbouring estates or you may wish simply to follow the majestic red deer within walking distance from our self-catering properties with your camera. Many people come to Mull to experience the wildlife. 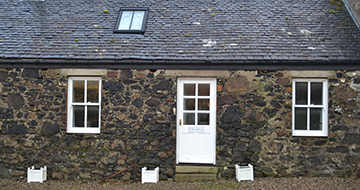 There are many ways you can do this from simply walking around Ardnacross, where as well as the farm animals you can see deer, otters and even golden eagles have been spotted, to going on a wildlife safari either on land or sea. We have seen dolphins playing in the bay visible from the Stables kitchen window. In the summer months you can enjoy an amazing trip to see puffins on the many smaller islands surrounding Mull and the spectacular beauty of Fingal’s Cave on Staffa. We can provide you with a list of operators to help you book your trips. Or simply walk down the coast from our self-catering accommodation to enjoy oyster catchers, herons and curlews. Bicycling options range from hiring bikes locally to entering the Mull Cyclosportive event in June. We have included short break options to help you to book the houses for such events. The Island is also a popular location with schools for the Gold Duke of Edinburgh Award. There are two 9 hole golf courses in Mull; the one in Tobermory is renowned for its breathtaking views as well as the quality of the course. For music lovers, Mendelssohn on Mull provides a unique opportunity to experience Mendelssohn’s music in a setting which inspired his famous Hebrides Overture. Alternatively you may wish to visit historic Duart Castle, the ancestral home of Clan MacLean. In the south of the Island, Iona is a particularly popular day trip not only for its beauty but the ancient monastic buildings, often described as the cradle of European Christianity. We are very happy to help with ideas and information on what to do and provide our guests with a comprehensive list of links to suitable websites.